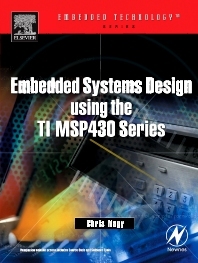 Learn about designing, programming, and developing with the popular new Texas Instruments family of microcontrollers, the MSP430 series with this new book from Chris Nagy. This product line is experiencing explosive growth due to its low-power consumption and powerful features, but very little design and application information is available other than what is offered by the manufacturer. The book fills a gap in the technical literature for embedded systems engineers by offering a more complete combination of technical data, example code, and descriptive prose than is available from the manufacturer reference information, and is useful to both professionals and hobbyists. Intended for embedded engineers who are new to the embedded field, or for the thousands of engineers who have experience with other microcontrollers (such as PICs, 8051s, or Motorola HC0x devices) but are new to the MSP430 line, Chris Nagy offers a thorough and practical description of the device features, gives development guidelines, and provides design examples. Code examples are used in virtually every chapter and online. The book is divided into three sections: the first section provides detailed descriptions of the devices themselves; the second describes hardware/firmware development for the devices; the third is designed to incorporate information from the first two, and provide guidelines and examples of designs. Chris Nagy is a senior firmware engineer currently working in the field of utility telemetry systems. He has spent the past several years designing with TI's family of microcontroller products.